DEVELOP South Africa introduces the ineo 1100, an entry-level printing system that offers new applications and contemporary functions with a faster turnaround time. This device is also the first production printing machine from DEVELOP to support Konica Minolta’s OpenAPI technology, which allows developers to create applications that communicate with this print system. Even when it comes to a successful system as the ineo 951, the entry-level production printing system DEVELOP launched in 2012, there is always room for improvement with monochromes. As its successor, the ineo 1100 has a colour scanner among other useful features, and is ideally equipped to deal with the frequently changing jobs within on-demand production printing environments. Built for high productivityThe ineo 1100 is ideally equipped to handle the production printing demands of internal print rooms, digital print service providers and other high-volume printing environments. The device’s high productivity ensures short turnaround times and a great benefit when tackling time-critical print jobs. 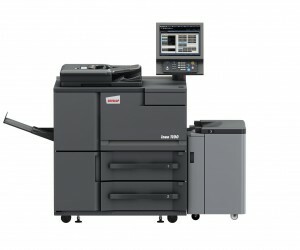 Since the vast majority of high-volume jobs in this segment are still printed in black and white, the ineo 1100 offers all that is required of an entry-level monochrome production printing system – with the added advantage of a colour scanner, which scans documents in a single-path duplex operation at up to 180 ipm. Furthermore, the output speed of ineo 1100 does not come at the expense of quality. A genuine resolution of 1,200 x 1,200 dpi, unique screening technology and customised professional quality tone curve and screening adjustments ensure an outstanding output quality. Designed for flexibilityWith a maximum paper capacity of 9,000 sheets in five cassettes and a newly developed bypass tray where 250 sheets can be inserted, the ineo 1100 is well equipped for any high-volume print job, and even extensive mixed-media jobs can be handled easily. The device is media flexible with a standard grammage range of 40-300 g/m2 (optionally up to 350 g/m2) and paper formats from 92 x 132 mm to SRA3 (max. 324 x 483 mm) – enables the ineo 1100 to tackle just about any job a production printer is likely to face. 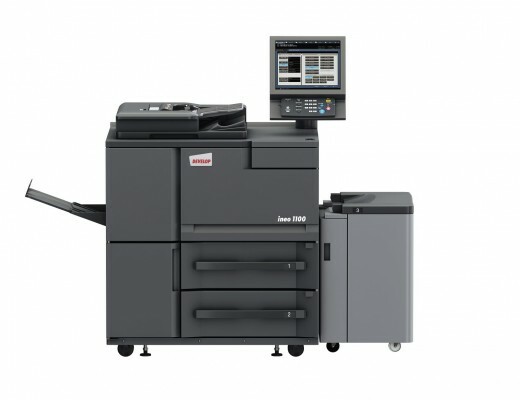 This print system also offers production of up to 100 pages per booklet with automatic ring binding; 2-point and choice-of-corner stapling for up to 100 sheets; two or four hole punching (also for post-inserted documents); Z-folding for inclusion of A3 documents in A4 printouts; letter folding for up to three pages; and a newly developed output tray for offline finishing or where no finisher is needed. The optional GBC punch unit comes with a wide range of die sets to ensure compatibility with most popular punching schemes, for example, metal-based (wire) or plastic (comb) binding. Programmed for communicationThe ineo 1100 is designed to support OpenAPI technology, which allows developers to create applications that communicate with this print system. As a result, customers can use third-party accounting, authentication or scan-routing applications, such as YSoft SafeQ in combination with this printer. Since the print system has powerful features that can be controlled via an easy-to-operate touchscreen, the ineo 1100 represents a successful symbiosis of professional-quality printing, uncomplicated usability and extensive utility.